Greetings in the name of our Lord and Savior Yeshua! I was given the privilege of sharing a few of my thoughts on this website. For those reading this I know you realize we live in perilous times! These times are more than likely why you have found this website, searching for truth. Like you I have been on a journey of learning many things over the last year or so. Needless to say, my eyes have been opened. That has been a good thing but at the same time there is much responsibility that goes with the understanding gained. Part of the responsibility is acting on that knowledge. My learning has brought me to the understanding is the times we are in are not like any before. This is now a time which begins the events that have been planned for this allotted time. It appears we have reached the end of Daniel’s time line of 70 weeks which means the completion of what the Almighty had planned for that time (Daniel 9:24-27). That time line can be difficult to understand but I believe we are at the completion. I feel confident that most you reading this will be more of a conservative mind set and glad this last election turned out like it did. It appears we have a president that desires to make things better and is making great strides attempting to accomplish that goal. It’s like a big sigh of relief “whew”, is it not? Maybe some of the horrendously bad things that have been done not only in our country but in the world, can possibly be corrected! As I contemplate our current time, observe current events and strive to apply the knowledge I have gained, I ask myself; “Can it really be the time that we are about to see the Almighty’s judgement begin?” I mean, at least for me it looks like it’s getting, or going to get better, right? I go the grocery store and the shelves are stocked to the brim, the produce department is overflowing and even though the prices are a little more expensive, I can afford it. I’m not really hurting for food and the basic necessities! It seems to a large degree to be life as usual. However, then, wanting to be a good steward and a watchman, I start applying the knowledge I have gained. And when I do that, the appearance of things change, dramatically! We (especially in America who have been blessed beyond our understanding) cannot let ourselves be lulled to sleep. Applying the knowledge I have gained reminds me of scripture and current happenings. This passage has been one that is very upfront in my mind. What did our Savior tell us. Mat 24:8 All these are the beginning of sorrows (birth pains). We have some crazy people rioting and threatening the basic peace in our nation because they just don’t like the changes. We are a nation divided (kingdom against kingdom?) We are not the only nation with these type events, it is in other nations as well. Consider that this has really begun over the last year and has escalated in a big way in the last number of months. As of 02/21/17 there were 373 quakes in the last 24 hours. Compare those numbers to the entire calendar year of 1970 totaling 1,302 quakes, avg. 3.5/day. Volcanoes Globally – Currently there are 80 active volcanoes either currently erupting or that have minor activity!! Remember what our Savior told his disciples as to what was coming at the end times, that it would be like what had happened in the past in prior similar destructive events. In my search for knowledge, understanding and wisdom I, not unlike many of you, have looked into and read many varied things. One of those things that I came across, and I really don’t even remember how or why I did as I wasn’t looking for it, was about Planet 7X. You may have heard or run across information on this topic which is known by many names which include Planet X, Nibiru, Nemesis, Planet 9 and others. One thing I quickly found out is there is much misinformation about this planet. However, I was introduced to Gill Broussard and his website (www.planet7x.net) and youtube channel (https://www.youtube.com/channel/UCkADhlWdCVcsB6GKsYWZ4XQ) that presents the information in a much different way. The information presented is based on biblical events correlated with the real and actual data on this planet. Gill was an engineer technician in the oil filed and had a hobby of astronomy. He had a telephone call one day in which the caller asked him about Planet X. He responded basically that there was no legitimate data to back up the claim of this planet and it probably did not exist. Afterward he decided that he should look into this a little more so he would have some better information if he was asked again for his opinion. Well, this started a 3-year journey of research and discovery wherein the Almighty revealed to him great and awesome things concerning this planet and many different biblical and secular events. A statement he made that has stuck in my mind is “The events of this Planet are the most talked about in scripture and the least known, until now.” It is only in the last 10 to 15 years that we have gained the knowledge and acquired the information needed to figure it all out. One of the current technologies vital in being able to put the pieces together is the astronomical software available today that has the orbits of many planets and stars calculated where you can enter a date past or future date and see the alignment and positions on that date. Pretty amazing software. You can get a free copy here: http://www.stellarium.org/. Remember you are to view everything from the perspective of Jerusalem Israel! One of the first things Gill did was to name this planet “Planet 7X” for the main purposes of differentiating it from all the misinformation on the internet and elsewhere. The title also refers to the indication this planet is approximately 7 times the size of earth. An entry point of the NEO on Earth’s orbital path near the end of August. An exit point of the NEO on Earht’s orbital path near mid March (Passover). A separation of 150 days on Earths orbital path between entry and exit points. The position of the NEO path on Earth’s planetary plane. It is from this beginning that Gill was able, over 3 years of research, able to put together the pieces of how this NEO (Planet 7x) is in Scripture and has been used by the Almighty to accomplish his will and purposes and just the exact time. Needless to say, there is much information Gill has put together which verifies all of this and can be downloaded on his website from dropbox. One the signs that is coming and that is already in the process of coming to completion is what is described below and can be seen the software above mentioned. The Almighty has given us a sign so that we will be without excuse as to the times we are in. The moon will be at her feet. About to give birth to the planet Jupiter which is in her womb. Jupiter has been known from ages-old to the present as the King Planet. Mythology – Jupiter represents the ruler of the gods, Zeus. The planet is the largest and most magnificent which is representative of the great Zeus. Jupiter represents people in power, magistrates, great professors, and religious figures. Jupiter was the star of Bethlehem, a star proclaiming the birth of a Jewish King. Will it again be a sign of the coming of the King and a sign of the tribulation being ushered in? This sign will happen this March 15 and 16. It will not happen again. 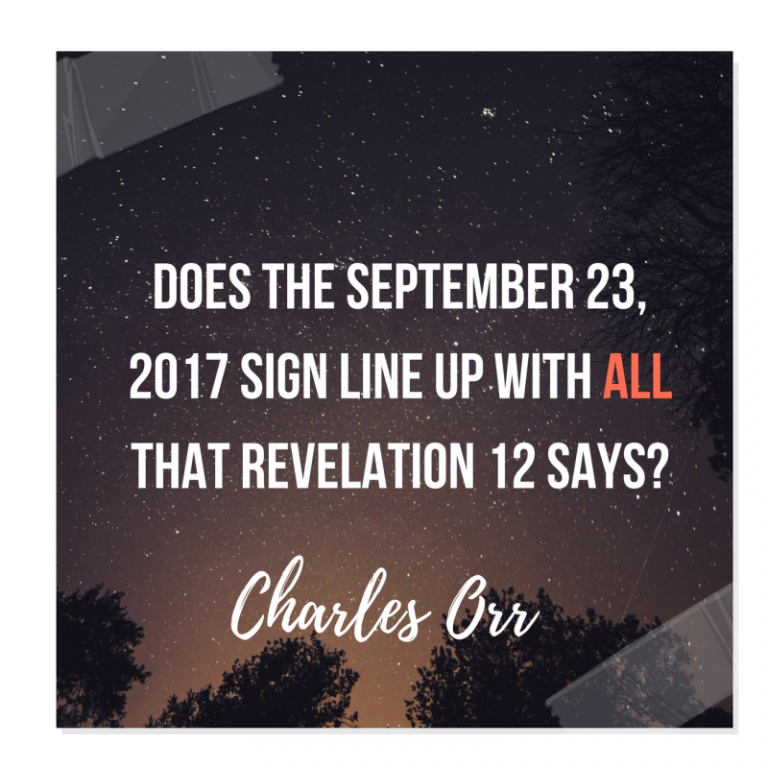 When you look at this sign on the stated dates you see all that is stated in the Revelation 12 passage except, where is the sun that is clothing her body? Well, there is a similar event on September 23, 2017 that is erroneously used as the sign and you will see that the elements of the passage are there but they don’t meet with things exactly. Virgo is out of the womb and the sun is near her head. You think that is it! But, in reality the Almighty gives us signs that we can actually see and understand. If the sun were out at her head then it would be daytime and you would not be able to see the stars and the sign! Consequently, in his learning, Gill learned the word sun in the passage should be more correctly translated as illuminated body/object. When you take the information obtained from the Chinese Guest Star discussed above and placed in the software, you see that the illuminated body will be the planet 7x. Remember the exit point of 7x is on the earths orbital path near mid March (Passover). The heavens are being used to give us a sign and knowledge of the Almighty’s timing. It appears this timing would coordinate with Seal #6 in Revelation chapter 6. It is believed this sign indicates the beginning of the great Tribulation discussed in Revelation. We cannot tell the future but we are called to the watchful and use the information we have been given that we might apply that to what is found in scripture. Something to seriously consider! In conclusion, I restate Gill’s statement “The events of this Planet are the most talked about in scripture and the least known, until now.” With our advancement in technology, especially the astrological software, and the ancient records from around the world, we can now connect the dots with the events caused by this planet and realize that the Almighty will use this planet again to accomplish his will and purposes. Don’t forget all the signs currently going on in our world that our Savior told us would be happening as “birth pains” prior to the coming of this planet. You see, because it is this planet that causes all these (birth pains) events! It would appear my friends that we are very close! I have attempted to share with you the basics of my gained knowledge and understanding. I would encourage you to look at Gill’s information on his web pages mentioned above. There is so much more information! With this knowledge and understanding, I hope it make much more sense. To me it has!